Do you want to know how to create a Net Promoter Score (NPS) survey in WordPress? Unlike a traditional satisfaction survey you can create using a Likert Scale, an NPS survey helps you to better gauge customer loyalty and make your business more successful. 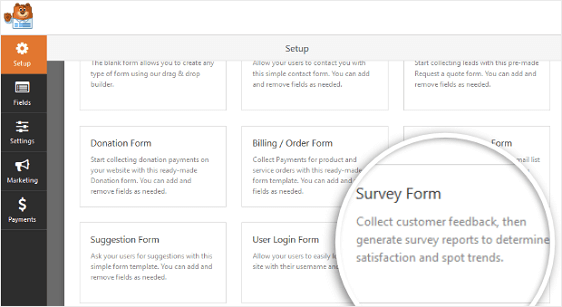 In this article, we’ll show you how to create an NPS survey form in WordPress using the popular Surveys & Polls addon in WPForms. A Net Promoter Score, or NPS, is a calculation that helps you determine how your site visitors, customers, or even employees feel about your company. Finding your company’s NPS is easy to do. All you need to do is ask one simple question: How likely are you to recommend our company to a friend or colleague? From there, your survey takers will answer that question using a scale of 0-10. Zero means they are unlikely to recommend your company, and 10 means they are highly likely to recommend your company. Promoters: Anyone answering with a 9 or 10 are considered loyal people who will continue to buy from you and recommend your company to others. Passives: Anyone answering with a 7 or 8 are satisfied with your company but not entirely sure they’ll recommend you to others. In fact, they might even be vulnerable to your closest competition and take their business elsewhere. Detractors: Anyone answering with a 0-6 is unhappy and will not be recommending your company to others. Their negative views may harm your brand’s reputation and even your bottom line. As people take your NPS survey, a net promoter score calculation is determined. In other words, the percentage of detractors that have taken your survey is subtracted from the percentage of promoters to yield a score that ranges from -100 to 100. The higher the NPS, the more loyalty your company has. 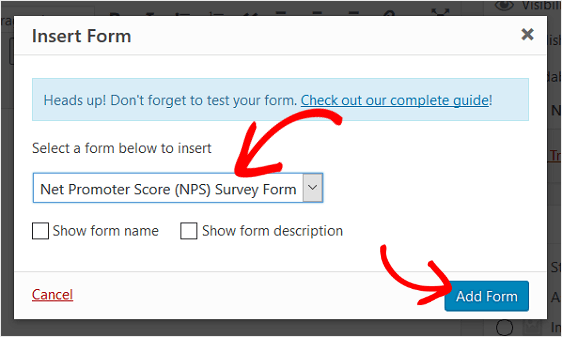 Now, let’s take a look at how to create a Net Promoter Score survey form in WordPress using WPForms. Next, go to WPForms » Addons and find the Surveys & Polls Addon. Install and activate the Surveys & Polls Addon. Once your WPForms Surveys & Polls addon is active, go to to WPForms » Add New to create a new form. On the setup screen, name your form and select the Survey Form template. WPForms will create a survey form. Here, you can add additional fields by dragging them from the left hand panel to the right hand panel or delete form fields you don’t want. To make changes to your form fields, simply click on the field and make your changes on the right hand panel. You can also click on a form field and drag it to rearrange the order on your NPS survey form. To make things as simple as possible, we’re going to delete all of the survey fields that are pre-set in the template. Then we’ll add the Net Promoter Score field and make changes to the Label. After the changes, this is what our NPS survey form will look like in the Form Editor. One of the neatest things about the Net Promoter Score form field in WPForms is that it has been designed to work with conditional logic so you can get even more information from your site visitors when they fill out your form, regardless of their answers. 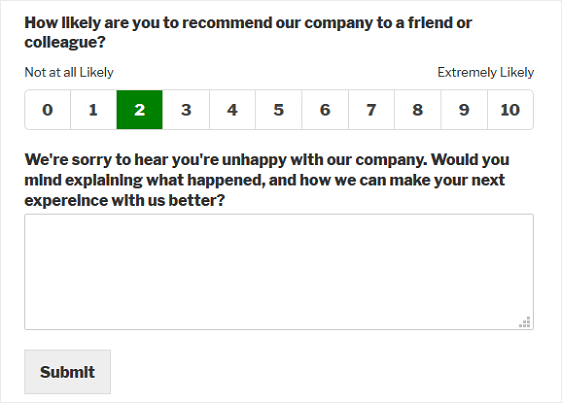 For example, if someone answers your NPS survey form as a promoter, you might set up conditional logic to display a text box asking if they might consider submitting an official testimonial about your company. After all, people love social proof, and testimonials from actual customers that are happy with you is a great way to encourage more sales in the future. On the other hand, if someone answers your survey as a detractor, you might set up conditional logic to display a text box asking them what went wrong and how you can make things better moving forward. To set up conditional logic on your NPS survey form, first add a paragraph text form field to your NPS survey form and customize the label. Next, click on the Conditionals dropdown menu and click the checkbox labeled Enable conditional logic. Then, customize the conditional logic to meet your needs. For our example, we’ll click on Show this field if How likely are you to recommend our company to a friend or colleague is less than 9. Now, anytime someone answers with an 8 or below, the comment section will appear for them to explain what happened and what you can do better next time. Notifications are a great way for you or a team member to find out an NPS survey form has been completed by a site visitor. Unless you disable form notifications, any time a form on your site is processed, the admin email for your website will receive a notification. However, you can also send a notification to someone on your team by adding their email to the Send to Email Address field. In addition, if you use smart tags, you can even send a form notification to your site visitor to let them know their form has been received. This is only helpful if you collect email addresses on your NPS survey form. Confirmations are a great way to let site visitors know immediately that their survey form has been submitted. Message. This confirmation displays a simple message once a site visitor submits their form letting them know their form has been accepted. Show Page. This confirmation type will take site visitors to a specific web page on your web page. For help with this step, check out our tutorial on redirecting site visitors to a thank you page, as well as our guide to creating effective Thank You pages. Go to URL (Redirect). This last confirmation type will send site visitors to a different website. For step by step instructions, check out this documentation on setting up form confirmations. After you’ve created your Net Promoter Score survey form, you’ll need to add it to your site. WPForms allows you to add your forms to your site in several locations, including your blog posts, pages, and sidebar widget areas. Let’s take a look at the post/page embed option. Start by creating a new post or page in WordPress, or editing an existing one. Then, click on the Add Form button. Next, select your NPS survey form from the dropdown menu and click Add Form. Lastly, publish your post or page so your NPS survey form will appear on your website. As people fill out your NPS survey form, WPForms will calculate your Net Promoter Score. To view these results, go to WPForms » All Forms. From there, hover over the form name to display the extra menu items, and click on Survey Results. Once you’re on the Survey Results page, you’ll be able to see your Net Promoter Score calculations. You’ll see the number of detractors, passives, and promoters that have filled out your NPS survey form. You’ll also see your final Net Promoter Score. And there you have it! You now know how to create a Net Promoter Score survey form in WordPress. If you want to learn how to get more form conversions, check out our roundup of research based tips to improve contact form conversions. And if you want to take it a step further, and work on driving more traffic to your website, check out how to boost your SEO rankings.